The Pavilions Shopping Centre Swords represents one of the largest and most innovative shopping developments in the Dublin, if not Ireland The Centre commenced trading in October 2001 and has continued to grow from strength to strength; the opening of Phase 2 in 2008 has further complimented this growth. Visiting The Pavilions, as a visitor to the area or as a local resident, is a truly enjoyable shopping experience. The laid back atmosphere with friendly and attentive staff adds to the diverse range of shopping, eating and service outlets available. There's a hugh mix of locally owned and and international outlets including Dunnes Stores, Pennies at Main Street side, Superquinn and with phase 3 starting in the new year with Marks And Spencer and Debenhams holding the anchor tenant shop. The new phase 3 will cost around 400 million to complete which will be 50,000 square meters. 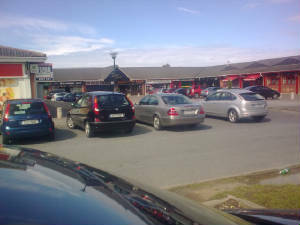 The Manor Shops are located on the Brackenstown Road Swords. The shopping center consists of a pub, Manor Inn which has a bar and lounge with music every weekend, a hair dressers, a chipper, a bookies , a Spar shop and an African shop. There's also an Asian restaurant which searves great food every night. Swords Manor housing estate construction began in 1981 and the estates were compleated in 1985. Estates in the area are. The Berwick, Swords Manor, Ormond and Abbeyvale, other houses in the Brackenstown area that were built around the same time are . Brackenstown Village and Parkview.